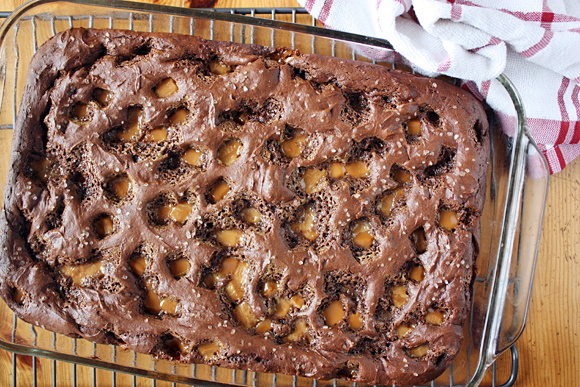 The most magical ingredients in all the land mixed together in one uber easy, uber tasty cake. 1-Preheat oven to 350°F. Lightly grease a 13-by-9-inch pan and set aside. 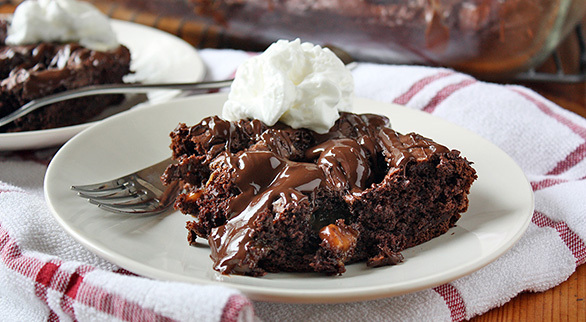 2-In a large bowl, whisk together chocolate pudding and milk for one minute to combine. 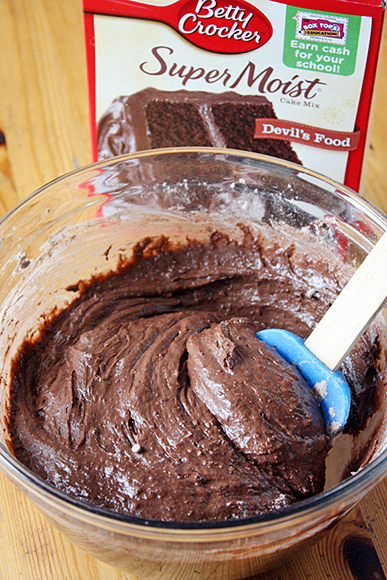 3-Add cake mix ONLY and stir until thoroughly combined. 4-Spread batter evenly into bottom of prepared pan (batter will be thick). 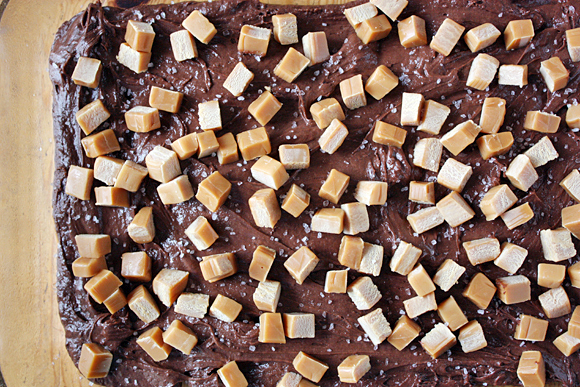 Sprinkle with chopped caramels. Sprinkle with sea salt to taste (remember: A little bit goes a long way). 5-Bake cake 30-40 minutes or until edges pull away from sides and a toothpick inserted in the cake portion comes out clean. 6-Remove cake from oven and let cool on a cooling rack. 7-Pour chocolate chips into a medium microwave-safe bowl. Microwave on high for 2-3 minutes, stirring every 30 seconds, until chocolate is fully melted. 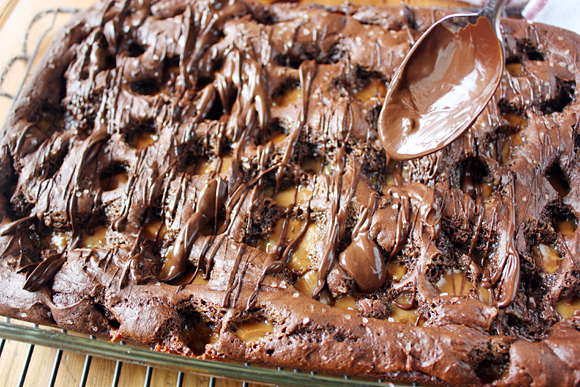 Using a spoon, drizzle chocolate over cooled cake. 8-Serve cake with a dollop of whipped cream, if desired. First, we gather our ingredients. 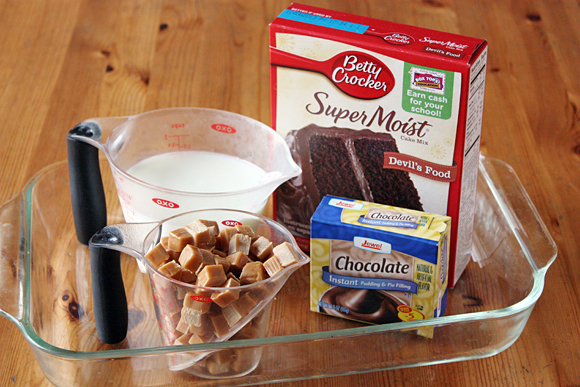 I kid you not, all you need is some milk, a package o’ pudding and a box o’ cake mix and you can bake a cake. IT’S SCIENCE. Mix up the milk, pudding and cake mix (that’ll be the cake mix and only the cake mix, my friends – no dilly-dallying with extra cake ingredients necessary) and spread it evenly in the bottom of a lightly greased pan. Then sprinkle that sucker with chopped caramels (omgeee!!) and a dash of coarse sea salt (double omgeee!!). Bake it all up until it’s nice and cake-like. 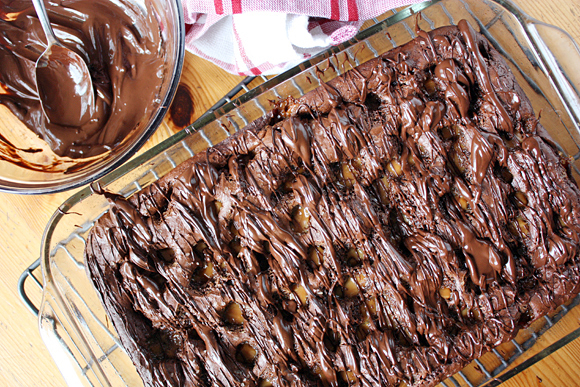 Now melt some chocolate chips in the microwave and drizzle ‘em all over that pretty cake. Ta-dum! Look at you and your super-swift cake baking talents. Do you see this madness? DO YOU? It’s no wonder this cake bewitched me into making it. Sheesh.